I am using Funkbox & AUM. I cannot use Funkbox inside of AUM as it messes up sync so I am using it externally sync'd via Ableton Link. I'd like to be able to use it inside of AUM if possible? I have tried a few different settings but maybe I am missing something. What happens if you disable LINK in all apps? AUM and FubkBox are both very good MIDI clock citizens for me. That's a real question though as I haven't tried hosting FB in AUM since round about 1943 in iOS years. Both AUM & Funkbox have great MIDI clock but it's not good for this scenario (Funkbox doesn't slave well.) Anyhow I was missing something... Just had to hit play in AUM first before doing anything else. Ahhh get all kinds of weird drift & sync issues if Funkbox is in AUM! So strange that it works absolutely fine outside of AUM. I wish Link was a little more configurable. I'm almost positive this problem is to do with start/stop messages. So close yet so far away... always some bullsht in the way on iOS. I've tried every app option to perform such a simple task. So many sub par sync option on iOS, pick a fuggin standard and make it work. Link is the answer, ditch the start stop messages & we're getting somewhere. 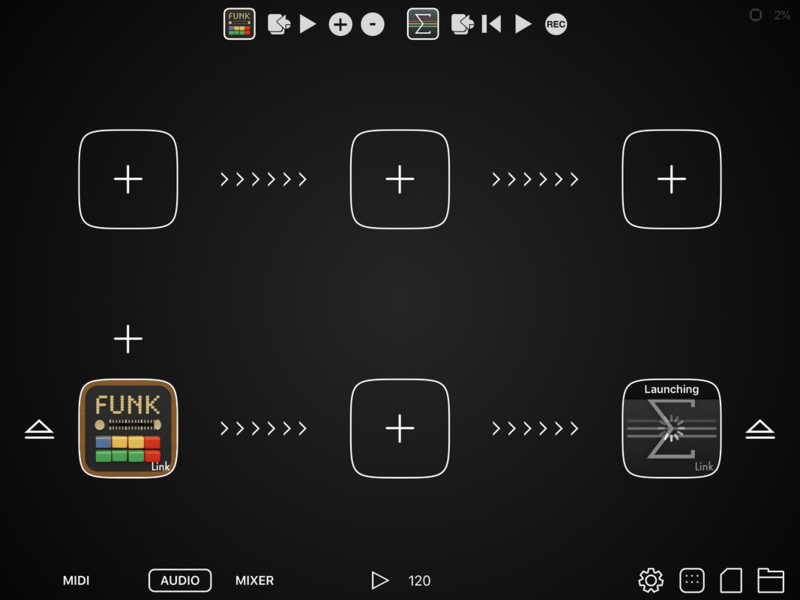 Maybe toss FunkBox into an AudioBus Audio input, with AUM in the output? Then you got Link + global transport + AB3 cool beans app switching + AB Remote at your disposal. Awesome! I was thinking this would be the solution last night, but forgot all about it. This is so great, major win. Damn you to hell iOS. I've tried resetting device, opening things up in every possible order. Step 6. Hopefully all is good and we can now make music. Now Funkbox is as old as the freakin sun. What could I use instead of it? I'd love to be able to just load one Audiobus or AUM preset and be ready to go. Just need a 909 emulation, prefer AU if possible. 90% of the time I'm only using a kick! Very surprised to hear that, as FunkBox has always been one of the solid clock slave performers outside of AUM. Have you tried the setup using ApeMatrix? And contacting the developer of FunkBox? I've just tried to let AUM send Midi clock to GR-16 and use its IAA output in AUM, syncs properly. Also, pause and restart work like they should. It’s working fine in my tests without doing anything special at all. I wonder if maybe something in your AUM session is the cause. Have you tried starting with just an empty AUM session, then adding apps a one thing at a time until it breaks? So I can use Link and follow the steps I outlined above and it will work flawlessly, it's just more setup time. The goal is one session that loads up every time so I can use it live without worry. It turns out I didn't really need AUM, but I was hoping it could be the answer. Back to waiting for a BM3 update. But ... if you use AB3 like I said, you just hit play in AB3 and everything (AUM) included starts perfectly. I must be misunderstanding something. Here’s a simple preset that works perfectly here. No special setup steps or order. Close all apps, load the preset, tap to load AUM and hit the AB start button. If that’s not what you’re after then I’ll step out since I have most likely missed your point. Yeah we're confused and I've been confusing. Thanks for the preset though! That's very nice thank you. Now my head hurts from even thinking how I could summarise what I was trying to achieve. Basically I bought AUM yesterday and wanted to see if it worked better (than BM3) for what I am doing... it doesn't. As to my launch issue with AUM & Audiobus, well I can't explain that other than Audiobus has always been a huge problem with apps misbehaving.